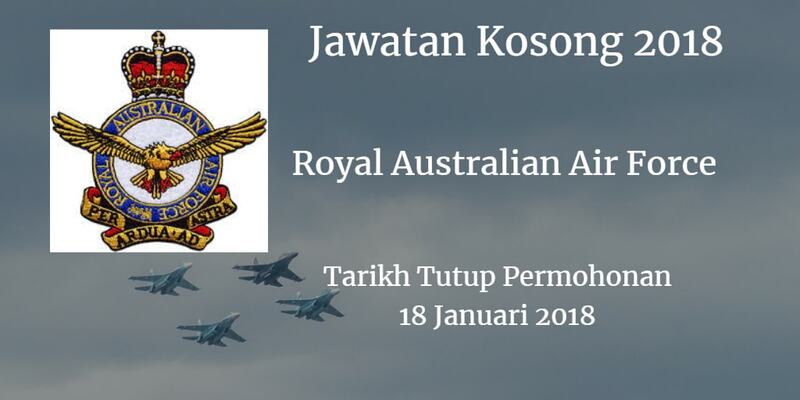 Jawatan Kosong Royal Australian Air Force , 2018. Syarikat Royal Australian Air Force membuka peluang pekerjaan Royal Australian Air Force, terkini 2018 ,ini. RAMP SERVICES OPERATOR, in aviation ground handling and refuelling at the Royal Australian Air Force at RMAF Base Butterworth, Penang.This position is classified as LCC2. Conduct aircraft ground handling and marshalling. Prepare cargo and passengers for air transportation. Pack and accept dangerous goods cargo. Operate Material Handling Equipment and other heavy vehicles. Perform daily fuel quality control on refuelling vehicles. Perform general, VIP and ambulance driving duties. Maintain cleanliness of Defence vehicles. Conduct all business practices within defence WHS guidelines. Must possess D driving licence (Car). Sound knowledge of Penang and surrounding area. Sound understanding of Malaysian road laws. Ability to maintain safety standards while conducting duties. Ability to work outside normal working hours, including weekends and public holidays. Previous experience in the aviation industry would be advantageous. Previous experience handling fuel and other dangerous goods would be advantageous. Previous experience utilising Material Handling Equipment such as forklifts, baggage conveyors, water trucks and tow motors would be advantageous.